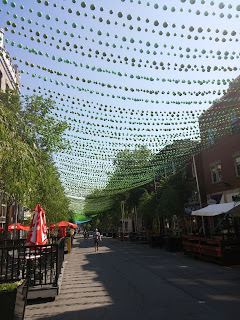 "Explore Montreal" has been on my To-Do List...for far too long. Last summer, just when things started to get good, I hurt my leg and was on crutches, and then off-crutches, I couldn't walk for very long, and I had air-conditionning in my car was broken, and I was too afraid to go and see what it would cost because I wasn't working...and I was still kind of exhausted, so I didn't explore very much. It was kind of cruel because two weeks before I hurt my leg, I went exploring and spent the entire day outside and it was fantastic. Since then, I've went to a few places here and there....but for the most part, my focus has been on finding a job, keeping a job, and making sure I have enough energy during the week for my job... Depression has played a huge role in my life since 2014. I was sort of getting better until February of this year, which is a story for another day (if you haven't already read it on my other blog). I’m sure it’s come up a time or two that I haven’t met any “true” friends here. I’ve met some people that I hang around with….a friend that I keep in semi-regular contact here….but no one…really “solid”. I hosted a brunch one day and met some super people I met, and I predicted that a natural friendship would take off, but work came up, I was sick, then stressed, then sick and stressed, and while they reached out, I kept forgetting to reach out back once I felt better (it’s still on my to-do list…) I’m realizing that instead of searching for “true friends”, I need to meet more people and most importantly, I need to realize the people that I already have in my life. I can't decide if I should write the long version or the short version. Ok, short version since I just deleted ten paragraphs of the long version and am making a second attempt at this. I bought my old Honda Civic in Alberta, went through a bunch of stuff, then my husband and I drove it across country to Quebec, where we would re-start our lives together....again. Things started to go downhill on the drive half-way through. I was depressed and fighting just to be ok. We had planned the trip to be a honeymoon/sightseeing of sorts....and I couldn't deliver.